Riding in motordromes started in the USA at around 1915. Initially, board tracks were used to race on. But because the motorcycles of the time were not miles per hour. Once the American motorcycle manufacturer Indian had succeeded in producing oil-tight motorcycles, the motordromes ( wall of death ) came into existence. At first, they were a publicity stunt by the Indian factory. The first motordromes had a gradient of 70-80 degrees, but it was soon discovered that at speeds of 25-32 miles per hour, motorcycles could easily “stick” to a wall of 90 degrees. A veritable “motordrome”. In the same period (circa 1920) the motordrome attraction made its way to Europe. Sala motordrome was built in 1937 in the Swedish village of Sala, making this motordrome one of the oldest still in existence in the world. Its departure from Sweden was very emotional for former owner Bengt Karlstrom (73) and his team. Bengt could still recall the motordrome being built by Yngve Wallsten. Jan Laurens brought this motordrome from Sala to the Netherlands in 2007. 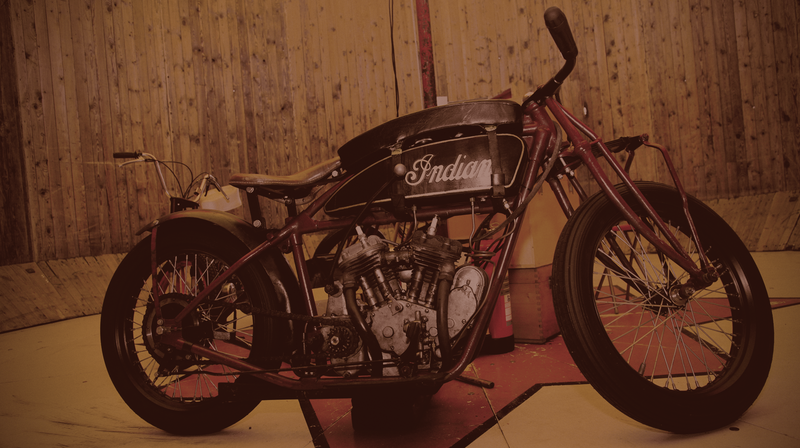 As in the early twenties, our team only rides Indian motorcycles. Durk Miedema has an Indian 600cc Scout of 1925. Rider and also owner of the Sala motordome, Jan Laurens, rides an Indian 600cc Scout of 1923. All riders learnt how to ride in the motordrome on a 50cc moped, which will also be used during our show. We regularly attend events with our motordrome, such as motorcycle days, fairs, exhibitions and various other occasions.